Sasha Nicholas designs dinnerware that can turn a classic white-porcelain plate into a statement-making centerpiece. Offering the finest European gold-rimmed porcelain, custom or in-house designed hand lettering and a fresh take on sustainable commodities, Sasha Nicholas isn’t your grandmama’s china shop. Surprisingly, Sasha Nicholas isn’t just your straight-out-of-college-first-apartment or newlyweds-only china shop, either. It seems, however, owner and lead designer Cynthia Nouri, who launched the highly successful dinnerware line this past January, is comfortable serving up surprises. “I was a practicing dentist for 27 years,” Cynthia explains on a rainy afternoon sitting in the Sasha Nicholas showroom. A dining room table – hosting six complete, beautifully styled place settings – is scattered with pencils and sketches of in-progress font work. For a show space designed to look and feel like home, Cynthia’s scattered “homework” sets a scene familiar enough to be any home in America. Cynthia fell in love with dinnerware while studying at Oxford University in England. 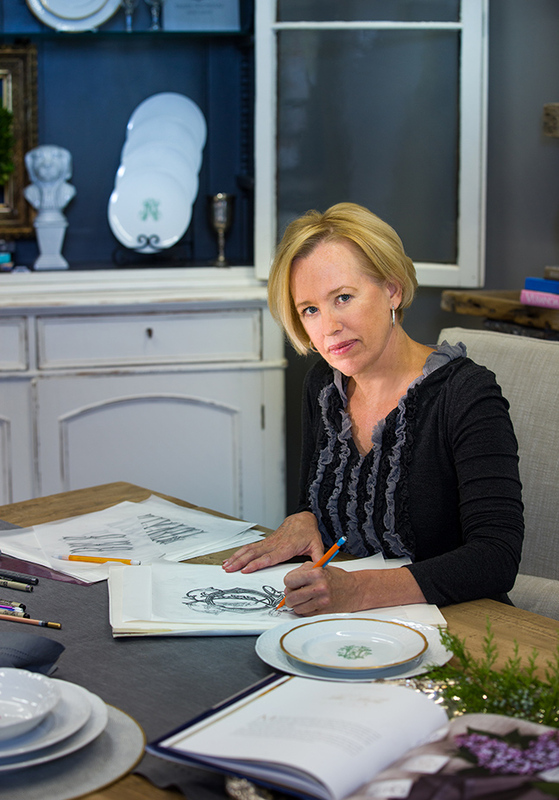 Her fascination with surface design, typography and hand lettering, paired with her lifelong passion to create functional products, inspired her to source, design and hand-paint platters and champagne buckets; she made her first sales in Texas in 2012. Today, Cynthia’s Sasha Nicholas line offers an heirloom piece for every course: casual, formal and everything in between. “I love to make things that are useful and that elevate the ‘every day’ to a higher level. I had looked at different materials, but through my knowledge of dental materials I found out that porcelain and bone china are the strongest materials made for dinnerware. I wanted the best, and the best is porcelain,” she says. 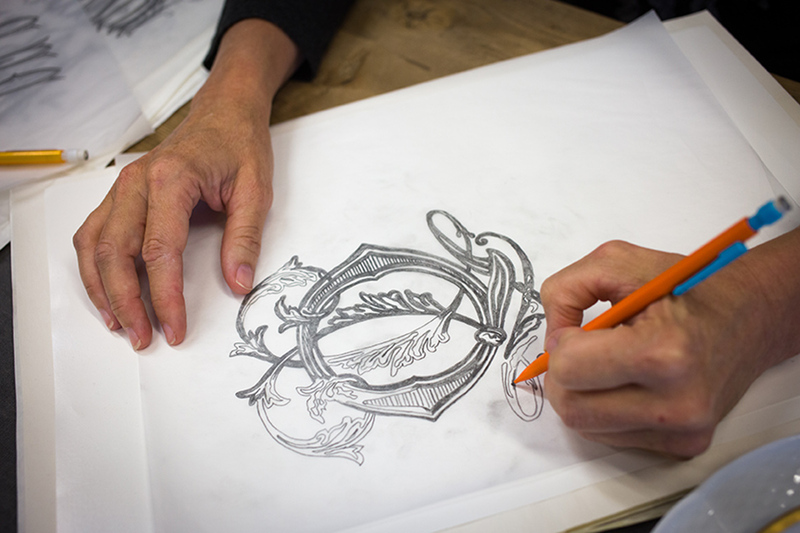 The custom, semi-custom and in-house monogram design options make endless opportunities all the more accessible. Any customer, any price point and any idea is open for exploration. 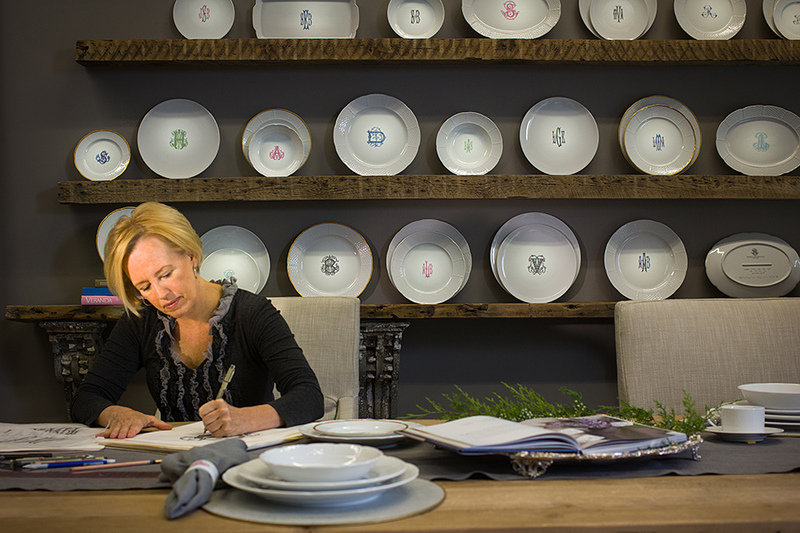 And their newest service, copying a handwritten note onto the back of a customized piece, turns a classic white-porcelain plate into a statement-making centerpiece. It is Cynthia’s design concepts – her radical interpretations of time-honored, traditional pieces – that ultimately embody what Sasha Nicholas brings to the table: one-of-a-kind, functional, beautiful dinnerware made for life outside the china cabinet.